Belle and her favorite tennis ball. This morning I heard the familiar thump, thump, thump, of Belle’s tennis ball. My signal that she wants to play catch. So the multi-tasker that I am, I threw the ball for Belle with one hand while petting Bonnie with the other. When Belle lost the ball under the sofa I moved the sofa so she could find the ball and low and behold we found a treasure trove of tennis balls and chew bones! Bonnie upon realizing her petting time was on hold for a minute came over to take a look. 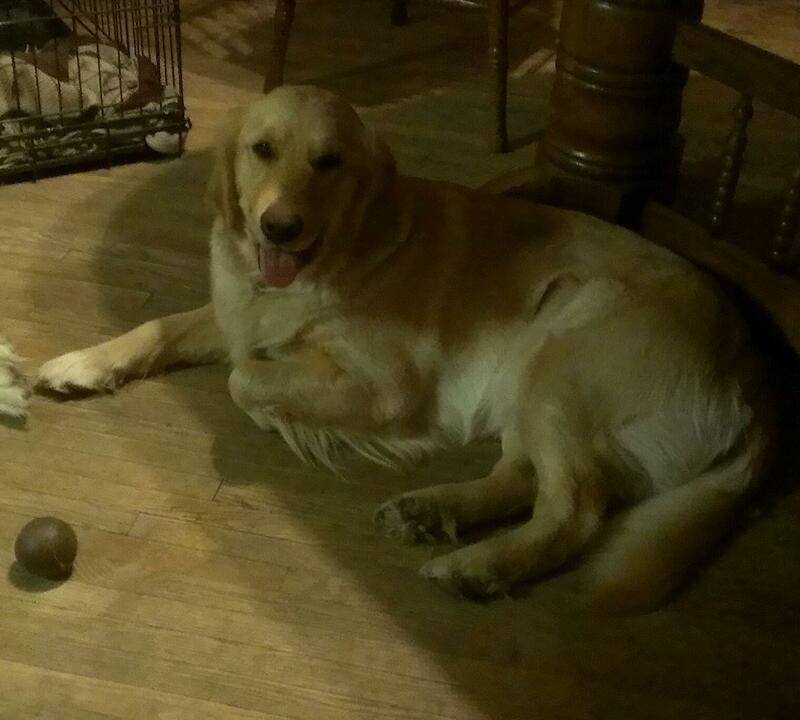 Belle lined up the first three balls for easy access then started wagging her tail even faster, why you may ask? Because she found her all time favorite tennis ball. It’s old but still intact and more importantly is an easy squeaker. Belle is squeaker challenged and tries very, very hard to make the tennis balls squeak. Bonnie is a champion at tennis ball squeaking and continually gives Belle squeaker lessons. The lessons are starting to pay off and the look on Belle’s face when she can make the ball squeak is priceless. Well, Belle just placed her tennis ball on the chair where I am sitting and Bonnie just came up for another cuddle so that’s my cue! Since our last post several things have happened. Bonnie is no longer afraid to jump into the van. Greg figured out a can’t resist treat and played “find it” by tossing cooked chicken closer and closer to and finally into the van. At one point our slightly stubborn pup was up on her hind feet firmly on the ground with her body, neck and finally tongue stretched as far as she could go to get that yummy treat. The next time the treat landed far enough in the van that she had no choice but to jump in. They repeated this several times and that’s all it took. Belle loves going to Rural King. When Greg gets home early enough from work, he has been taking Belle to Rural King. They walk around and explore the parking lot (she is on her leash) then venture inside where there are lots of people who want to greet her. She is a little cautious when meeting folks but after a couple of seconds she is all about the attention they are giving her. And if they want to throw in a tummy rub, well that’s ok too. We have decided to switch gears with our training and are no longer attending Canine Good Citizen classes. We haven’t given up on our goals of having the pups tested but have decided to work on the skills on our own and continue on from there. 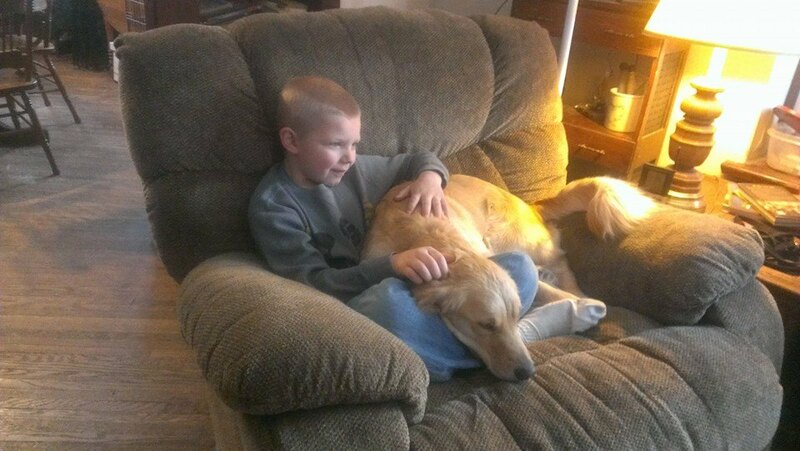 This past weekend the pups had fun playing and cuddling with our oldest Grandson who came for a weekend visit. When we returned from taking him back, the pups looked all over the house for their buddy. Last but not least the pups are totally enjoying the large mud puddle in their puppy pen courtesy of all the melting snow. No explanation necessary except to say that I have been waiting for the snow to go away, (Sh…we won’t talk about the possible several inches of snow we are suppose to get tomorrow night into Wednesday or the next system they are hinting about on Sunday/Monday) and mud puddles are a part of that process so pups splash away! As you know I started this blog a few months ago for our pups Bonnie and Belle and our cats Linus and Lucy. I have another blog titled Random Thoughts From My Everyday World that have several posts about the pups from when they first joined our family to when I started this blog. Feel free to go to that other blog should you want to read about the early days with our cuddle bunch.